Volunteer hosts serve as adult role models who can interact with the youth, occasionally participate in activities and games, but primarily are there to provide an adult presence at the center. All hosts must complete a background check to become a regularly scheduled volunteer. You can complete an authorization form for this when you come in the first time. Hosts can self-schedule for a Sunday shift at the Drop-in Center. We use an online scheduling system called Volunteer Spot. The following instructions describe how to schedule yourself for a shift. Click the button below to visit the online calendar. Or you can contact Craig Bell at scraigbell@aol.com to ask questions, get scheduled, or to arrange a first-time visit. Check us out -- this can be an unusually rewarding volunteer experience. Visit the Micah 6 Drop-in Center online calendar at this link. If this is your first time, you'll be asked for your email address. In the calendar that appears, choose the month in which you want to sign up and then click the Sunday for which youwant to volunteer. The yellow clipboard and "Sign Up" text indicate an available day to volunteer. On the line for Host, click the Sign Up Here! button. Please do not select any of the other options without first talking to a Micah 6 coordinator. Once signed up, the button changes showing your status. Click Save & Close at the bottom of the window. The yellow clipboard will have changed to green and the text will now read "Your Spots." This shows that you have volunteered for this particular day. You can continue to volunteer for additional days if desired. 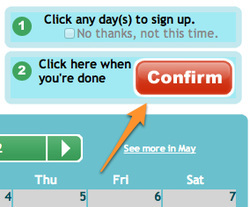 After making all of your volunteer choices, click the red "Confirm" button above the right-hand side of the calendar. You will also receive an email confirming your selection.